Shower rooms typically have larger enclosures in a variety of shapes, with many people choosing frameless screens or simple walk-through glass panels. In contrast, a wet room does away with the shower screen and tray altogether and has an open, fully waterproofed area, with water channeled into a single drain. As well as being a practical solution for people with restricted mobility, wet rooms are a good way to make the most of a small bathroom. They allow easy access to the showering area without the need for a full shower enclosure. The floor is usually sloped to allow water to flow away from the entrance into your waste water drain. With a dedicated showering space, you can opt for a wonderful waterfall shower head, a pulsating power shower or even a hydromassage column. 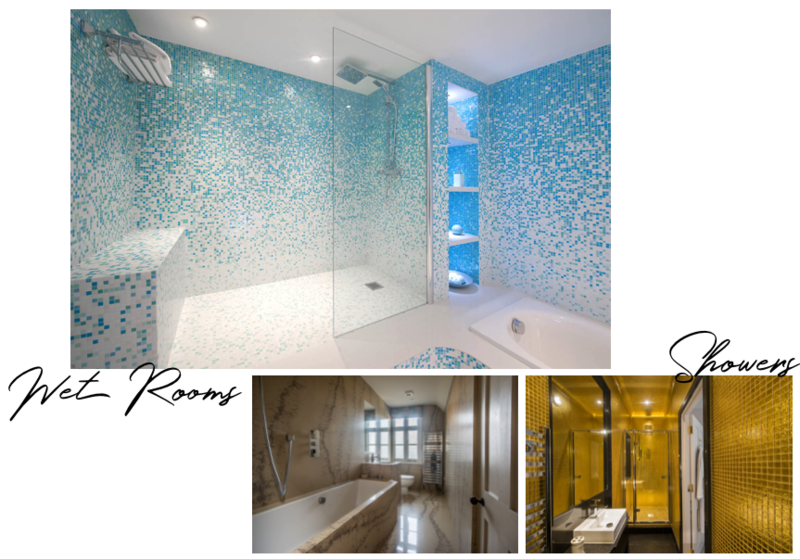 Whether you go for a shower room or a wet room, we’ll make it just the way you want it. If you fancy adding some bling to your morning showering routine, browse our range of sparkling surfaces and flooring. If you prefer to ease into the day gently, consider calming earthen shades and neutral tones. Mosaic feature panels are another stunning option. See more Bathrooms and Ensuites & Cloakrooms.